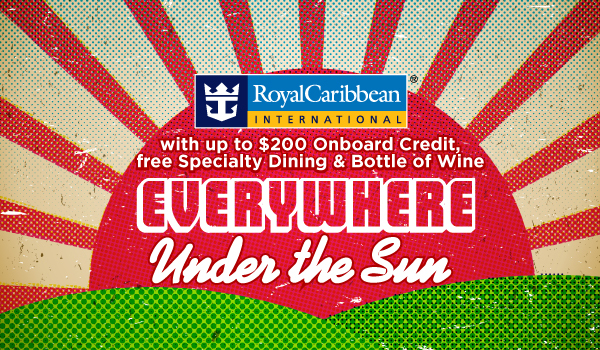 ROYAL CARIBBEAN + EXPEDIA CSC - Everywhere Under the Sun: Up to $200 Onboard Credit + Free Specialty Dining + Bottle of Wine | 6 night Caribbean Cruise from $639!!! All 6 night or longer October 2013 to March 2014 Caribbean sailings Onboard Cash Credit per stateroom: Ocean View $50 OBC per stateroom (Option Code SPJ3) Balconies $100 OBC per stateroom (Option Code SPJ4) Suites $200 OBC per stateroom (Option Code SPJ5) ECSC, OVC EXCLUSIVE Complimentary Specialty Dinner for 2 Complimentary Bottle of Wine This promotion combines with our Expedia Exclusive Stateroom groups only. CLICK THE FLYER BELOW TO SEE PRICES, AVAILABILITY & BOOK ONLINE ! Vsetky Plavby od Royal Caribbean v Karibiku - 6 noci a dlhsie Oktober 2013 az Marec 2014: Palubny Hotovostny Kredit na kajutu - Kabina s Vyhladom na Ocena $50, Kajuta s Balkonom $100 Suita $200 + EXKLUZIVNE od Expedia CruiseShipCenters, OVC Specialna Vecera pre 2 Zadarmo + Flasa Vina Zadarmo. Tuto akciu je mozne kombinovat len s Expedia Exclusive Stateroom groups. KLIKNITE NA LETAK PONIZE PRE CENY, DOSTUPNOST A OBJEDNAVKU ONLINE ! Royal Caribbean International is known for adventure on a grand scale. From the exciting destinations to the unique onboard activities like rock climbing, guests are sure to be entertained. Royal Caribbean guests also experience superb service and dining aboard some of the most innovative ships at sea. Terms and Conditions: *Up to $200 Credit!, Promotion ID: 10566. Onboard Credit Amounts: $50 for Oceanview, $100 for Balcony, $200 for Suites. Onboard credit offer is valid on oceanview or above category staterooms booked on any 6+-night Caribbean sailing booked between September 16 – September 30, 2013 departing between October 1, 2013 – March 31, 2014. One offer per stateroom. Onboard credit has no cash value, is non-transferable, not redeemable for cash, and will expire if not used by 10:00 PM on the last evening of the cruise. Offer is combinable with LAF and restricted rates (Seniors, Residents, Military). Offer is not combinable with any other offer or promotion, including, but not limited to, Interline, Travel Agent, and Net Rates, Crown & Anchor Discounts, Shareholder Benefits or Next Cruise offers, promotions, or benefits. Onboard credit is in US dollars. Offer is available to residents of the United States and Canada. Single occupancy guests paying 200% cruise fare qualify for onboard credit. These offers are valid for new individual and ECSC HQ group bookings only. Booking eligibility is based on when the booking is created not deposited or date of final payment. Royal Caribbean reserves the right to re-instate the fuel supplement for all guests should the price of light sweet crude oil according to the NYMEX (New York Mercantile Exchange Index) increase above $65 per barrel. Prices are per person, double occupancy, cruise only, and on select sailings. Prices shown are for stateroom categories as noted and are shown in U.S. dollars. Government taxes and fees are additional. Airfare is not included. Prices and itineraries are based on availability and are subject to change without notice. Prices and itineraries may vary by ship and sail date. Dinner & Wine offer is valid for oceanview or above staterooms booked between September 16 – September 30, 2013 on Caribbean sailings 6 night or longer departing between October 15, 2013 and March 31, 2014. Bottle of wine will be delivered to the stateroom on embarkation day. Not all ships feature specialty dining and restaurants vary by ship. Guests sailing on ships with no specialty dining will receive an additional bottle of wine in the room on embarkation as a substitution. Coupon is valid for dinner only for Chops Grille, Portofino, Giovanni's Table, Samba Grill or Solarium Bistro. Special dining events that take place in Specialty restaurants are excluded from the dining offer. Voucher cannot be used toward the purchase of specialty dining packages. Alcoholic beverages and sodas are not included, and are available at an additional cost. Specialty dining gratuities are included. Coupon has no monetary value and it is the guest’s responsibility to present this coupon to the restaurant when making their reservation should they wish to utilize this coupon. Reservations must be made onboard, and cannot be made in advance online in order to redeem this voucher. Coupon is valid for one dining experience for up to two guests in one stateroom. Voucher may not be broken up into multiple single dining experiences. This offer does not give guest(s) any priority for reservations, or if there is a wait to be seated in the restaurant. Booking eligibility is based on when the booking is created not deposited or date of final payment. This offer is not transferable. Subject to availability. Offer can be withdrawn at any time. Additional restrictions may apply. ©2013 Royal Caribbean Cruises Ltd. Ships registered in the Bahamas. CruiseShipCenters is not responsible for errors that may occur due to the transfer of information from selected third parties, technical error, or human error. Additional terms, conditions or restrictions may apply.